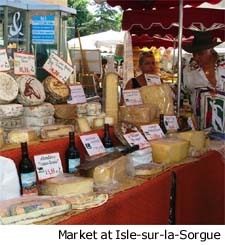 Les marchés are literally a way of life in France and we were determined to be a part of the scene. Some are eclectic—we encountered one in Avignon selling used shoes and hubcaps—but others, and the vast majority, are delectable. On a side trip to the precious village of Isle-sur-la-Sorgue we found a marché with the world's most perfect strawberries alongside reams of colorful handmade tablecloths and shelves of traditional Provençal pottery. Oh, to be able to carry it all home! We were embraced by local shopkeepers keen to see empathetic visitors in the early off-season. From our comfortable base in Fontvielle we filled our days with local road trips and visits to hotels and villas. 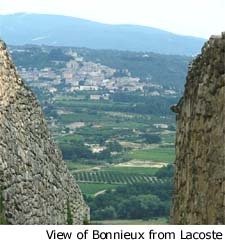 We drove east into the Luberon and passed through Ménerbes, Lacoste and Bonnieux on our way down to Aix-en-Provence. The Luberon—specifically the Petit Luberon which features the Parc Naturel Régional—includes about 50 small communities and they share the rugged terrain that is part and parcel of this limestone mountain range stretching west to east. It is a marvelous region if you like to hike in the wild, to be alone, and to hang out with resident wildlife which includes boar, beaver and eagle owls. As for moi, the Luberon has what I would consider a very different feel about it once you sit down and compare it to les Alpilles. I must confess to being extremely fond of the latter, the area around Maussane les Alpilles, Paradou and les Baux de Provence. The western part of the region has held onto that ageless Provençal charm that people really come here to experience and be a part of. We spent a lot of time around Fontvielle and we fell especially in love with St-Rémy on a number of sojourns there. Every little enclave is within an easy drive of everywhere else, and the treatment you get at the marchés and small local restaurants is heartwarming. We visited a number of hotels scattered about the area and three in particular stand out: La Bastide de Marie is tucked into a hillside near Ménerbes between Gordes and Bonnieux in the Petit Luberon, an authentic 18th century country house with an unbelievable cuisine. Oustau de Baumaniere is located in les Beaux-de-Provence at the foot of a limestone precipice beneath the looming shadow of a ruined chateau. Abbaye de Sainte-Croix is a meticulously restored 12th century monastery with four-star accommodations located above the medieval city of Salon-de-Provence in les Alpilles. Each of these three places has its own unique personality and what they share in common is the flavor of Provence and first-class service. As our trip came to an end we bade farewell to this wonderful corner of France and boarded the TGV in Avignon for thoroughly convenient transportation directly to the airport terminal—as in, do not pass GO. We could not help but reflect, as the beautiful French countryside whooshed by out the window, how great a destination Provence is, no matter how long you stay (preferably, in the words of Peter Mayle, a year or more). The spring and fall, occurring as they do at either end of the high season, make total sense as far as timing goes. The heat is off, the crowds are thin, and the place is yours. Everyone should come here at some point or another to see the poppy fields, the olive groves and the long vistas of lavender. 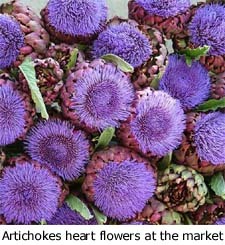 The smells, tastes and visuals in Provence are among the best in the world.